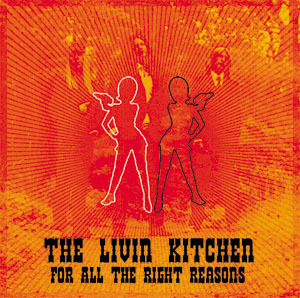 The Livin' Kitchen - "For all the Right Reasons"
Livin' Kitchen is a new Swedish band from the Stockholm area. They cite bands like the MC5, Hellacopters, Nomads, the Who, Freddy King, Rory Gallagher, Johnny Winter and AC/DC as influences. This is a 6 track demo CD recorded in December 2004. The band is a trio. So do they deliver the goods or not?? "Gonna Be Alright" opens the CD and you can really hear the 70's Johnny Winter influence on this track. Too bad he can't play the guitar like Johnny! "Black Mamba Groove" has a cool blues rock riff and groove. Nice track. "Long Gone Down" is another very 70's Johnny Winter style rocker. Remember when Rick Derringer played with Johnny??? "Won't Realize" starts off a slower track and a very Rory Gallagher influenced semi-acoustic track. "Into The World Of Tomorrow" is a 1½ minute outro like track with backwards guitar sounds and stuff, but very cool. Ok... well this is a pretty cool start for this new band. They avoid sounding like the Hellacopters and really remind me of the early 70's Johnny Winter rock and roll that I loved. My only complaint is some of the songs are a bit too much alike and all pretty much the same pace. Mix it up a bit and keep on rockin! For more information you can visit The Livin' Kitchen web site at: http://www.livinkitchen.tk.